Investigate the effect of strength and current using an electromagnet by how many coils you put on it and by changing the voltage. 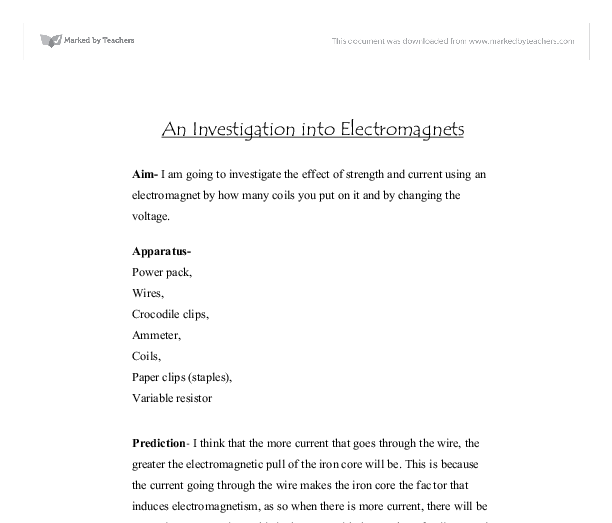 Aim-I am going to investigate the effect of strength and current using an electromagnet by how many coils you put on it and by changing the voltage. Prediction- I think that the more current that goes through the wire, the greater the electromagnetic pull of the iron core will be. This is because the current going through the wire makes the iron core the factor that induces electromagnetism, as so when there is more current, there will be more electromagnetism. This is the same with the number of coils around the electromagnet, the more power is returned so therefore the more paper clips will be picked up. Magnets were formed when certain molten metals, (iron, nickel and cobalt,) cool. Normally when the atoms in a non-magnetic crystallise, the atoms point in random directions. But because of the properties of the metals mentioned, these atoms line up into parts of the magnetic with similar directions called domains. This is because the earth has a magnetic field, and the atoms in the metal all follow these magnetic lines and form these domains. This is similar to what happens when an electromagnet is formed. 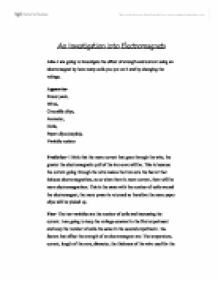 Bibliography- I used the Internet and my science book to help me with my planning. Conclusion- I found out that the more coils wrapped around the iron core the more paper clips got picked up and the bigger the current going into the iron core the more paper clips got picked up this matched my prediction, apart from on the second experiment when 3.5 amps was going into the iron core it only picked up 9 paper clips this is a strange result but maybe I didn’t have 10 coils on the iron core this could have easily affected it. Evaluation- I didn’t experience any problems as such but maybe next time I will keep other variables constant for example the size of staples used or the weight of the stables. I couldn’t look into electromagnetism in a lot more detail. lowest temperature that the greenhouse is allowed to reach is 21°C, and the highest 31°C, with a slight adjustment to the circuit controlling the windows and heaters, the upper and lower potential difference boundaries of activation, which the control circuit runs from, could be changed. The graph for these were a straight line, with positive gradients which proved my prediction to be correct, see graph one (1 Ohm resistor) and graph two (2 Ohm resistor). This means that ohms law was applicable in this experiment. line of best fit did not pass through them) were close to the best-fit line and were basically within the trend. They did not affect the accuracy of the conclusions, as they were not anomalous enough to make the best-fit line a curve as opposed to the straight line that is was found to be. This will also show how accurate my results are because it will show how close to the actual value for the temperature coefficient of resistance my estimate was. Here is a list of some of the temperature coefficients of resistance for metals. the voltage output and current in circuit to an accuracy of up to 2 decimal places. If you were to look at my averaged graph, there are error bars. The error bars show that there is greatest error when the light intensity was extremely low. to see which type, diameter of wire and the input current is the best for my investigation to give me a suitable range of current values and so that the results are more reliable, so if there was to be problems then they would be solved before the real experiment. The rest of the supplies also we will see as we study each of the experiments. The first experiment will be one for the metal wires, LDR, thermistor and bulb. The circuit diagram looks like this. This circuit diagram will be used to find the IV characteristics of the above components.